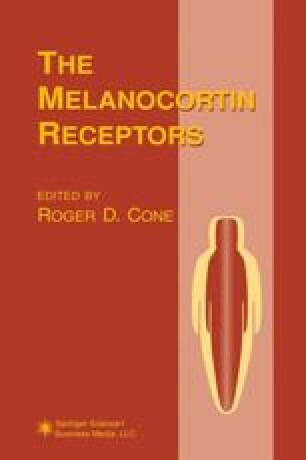 By the late 1970s, a range of evidence indicated that melanocortins could affect behavioral and visceral functions, neuroendocrine circuits, and the neurochemistry of the brain (1,2) in addition to well-characterized roles in pigmentation and adrenocortical steroidogenesis. The discovery of releasable neurosecretory pools of α-MSH in brain tissue (3), and the discovery of an intrinsic POMC (proopiomelanocortin) and melanocortin-containing neuron system in the brain (4,5), began to point to a potential role of endogenous central nervous system (CNS) melanocortins in regulating many of these functions. The facts that similar melanocortinergic systems exist in the brains of lower vertebrate species as primitive as the lungfish (6), and in mammals are predominantly distributed in the phylogenetically ancient visceral neuraxis, suggests that the melanocortin system may subserve highly conserved roles. As discussed below and in Chapters 4 and 13, a fairly extensive literature now supports a fundamental role of melanocortins in diverse CNS functions. Nevertheless, the identification of CNS-associated melanocortin receptors is a fairly recent development. Following the demonstration of MCR in the CNS in 1990 (7), the cloning of a family of MCR-encoding genes (see Chapter 7) paved the way for the recent explosive growth in interest in the physiological roles of melanocortins in the nervous system, and the molecular bases of melanocortin actions.